CWave is a short-range, secure, high-data rate Ultra-Wideband (UWB) wireless networking technology suitable for a variety of applications. Governed by the FCC Report and Order of February, 2002, UWB is regulated for use in the unlicensed spectrum range from 3.1 to 10.6 GHz. 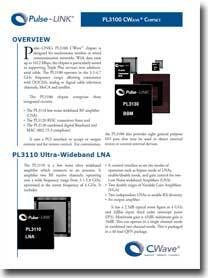 Pulse~LINK’s CWave is a unique UWB implementation with an operating range up to 10 meters. CWave wireless solutions share a common feature set with our Ethernet-over-coax technology and are delivered from a common chipset. CWave® opens up a world of communication possibilities with its unique capabilities. As a developer of core technology, Pulse~LINK welcomes inquiries from companies seeking novel solutions for today’s networking challenges. Our experienced engineering staff have developed multiple CWave designs and can work with your team, on an NRE basis, to speed-up your time to market.